During this week, the holiest week in Christendom, we reflect about the greatest act of love in history. Jesus died for our sins in an excruciatingly painful and violent execution. An innocent man endured torture, pain, and humiliation for us. On Palm Sunday, Pope Francis implored us all to reflect on who we would be in the Passion narrative. Particularly poignant he asked, “Am I like Pilate? When I see that the situation is difficult, do I wash my hands and dodge my responsibility, allowing people to be condemned- or condemning them myself?” The policy debate around capital punishment is immensely difficult as it requires us to confront a wrongdoer with mercy not retribution. As Christians, we must look at the humanity of the condemned man or woman and ensure that life is protected. Unfortunately, rather than addressing fairness in the death penalty system, Virginia’s policy debate took a gruesome turn in this year’s General Assembly session. Across the country, states are encountering difficulty obtaining the drugs necessary to perform lethal injections. The European Union has banned drug exports to states for use in executions and many American pharmaceutical companies also don’t want drugs intended to heal used to kill. The Virginia Department of Corrections is not immune to the drug shortage. Thus, HB1052/SB 607 were conceived to allow the Virginia Department of Corrections to default to the electric chair should lethal injection be unavailable for any reason. Thus, General Assembly debate centered on making sure there were always methods available to put people to death. Currently, an inmate is given the choice of lethal injection or electrocution; if the inmate doesn’t choose then the state defaults to lethal injection. The Virginia Catholic Conference opposed the legislation to change the status quo because it took away the inmate’s final choice and gave unfettered control over life and death to the Director of the Department of Corrections. This legislation went through a series of political maneuverings and several committee votes until it was finally defeated for the year. Regardless, the Commonwealth of Virginia remains one of the most active death penalty states (second only to Texas), putting over 100 men and women to death since the death penalty was reinstated nationwide in 1976. 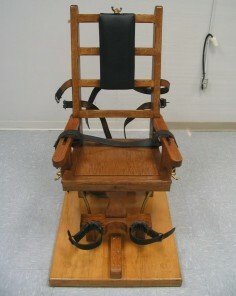 Unfortunately, Virginia is also one of only four states maintaining an electric chair as an execution method- in fact, “Old Sparky” is among the country’s most active electric chair (Virginia carried out five of the country’s last 10 electrocutions). Instead of embracing modernity and moving forward, some in the legislature looked backwards. After all, electrocution is technology dating from the late nineteenth century that began as a public battle between Thomas Edison and George Westinghouse over which form of electricity- “DC current” versus “AC current”- was more deadly in order to prevent their own current from being used for executions. The impetus for this disagreement and the ensuing lawsuit (where Edison was victorious) was because the state of New York wanted a more humane method than hanging. Nevertheless, electrocution should conjure up disturbing images and several inmates in Virginia have endured burning flesh and even caught on fire during executions.